Union Minister for Petroleum and Natural Gas and Skill Development Dharmendra Pradhan in a freewheeling discussion with Resident Editor of The New Indian Express, Odisha Srimoy Kar. them under GST, Union Minister for Petroleum and Natural Gas and Skill Development Dharmendra Pradhan on Saturday clarified that the Centre can not impose its decision on the GST council. 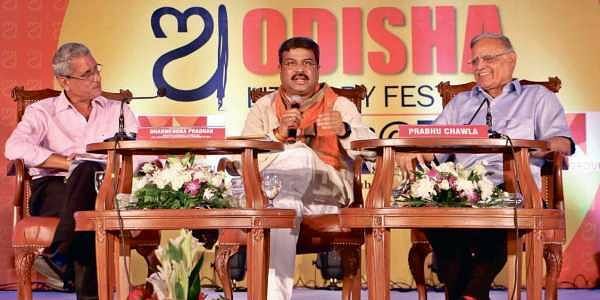 on the issue of bringing petrol and diesel under GST purview,” Pradhan said at the Odisha Literary Festival 2017 organised by The New Indian Express here in presence of Editorial Director Prabhu Chawla. under GST for benefit of the consumers. However, this has to be accepted by the GST council, he added. Since a majority of the States and the Centre are ruled by BJP, Pradhan said, some may argue that it is the responsibility of the saffron party to bring the two fuels under GST. But in a federal structure, the Centre can notorce its decision on the the States which are members of the council. “My ministry requested the states to reduce VAT (Value Added Tax) on petrol and diesel by 5 per cent, a day after the Central government cut excise duty on the two products to protect retail consumers from high global crude oil prices.While some states agreed and reduced VAT, many did not accept the proposal,” he said. While a State like Himachal Pradesh which is ruled by Congress reduced VAT by one percent, some states having BJP government have shown reluctance and are yet to take take a decision, he said. Noting that States are still not clear about the GST, the Union Minister whileresponding to Kar on the issue said it would not be prudent to pursue even BJP-ruled states to accept the decision of the Centre on political line. Pradhan said a perception is being created by a section of media about the declining growth and high rate of inflation while there in no truth in it. Bharatiya Janata Party’s most prominent face in Odisha, Union Minister Dharmendra Pradhan on Saturday said he will contest the elections from the State in 2019 elections. “Of course, I will contest the elections from Odisha,” he said responding to a query. “But whether as an MP or MLA, it is for the party to decide,” said the Union Petroleum and Natural Gas, Skill Development Minister.played here.